Spa day items include one Homedics nail spa deluxe kit for $5.00, one Lasonic jewelry cleaner kit for $5.00 and one Conair Facial steamer for $5.00. All 3 items are $5.00 each in good condition. 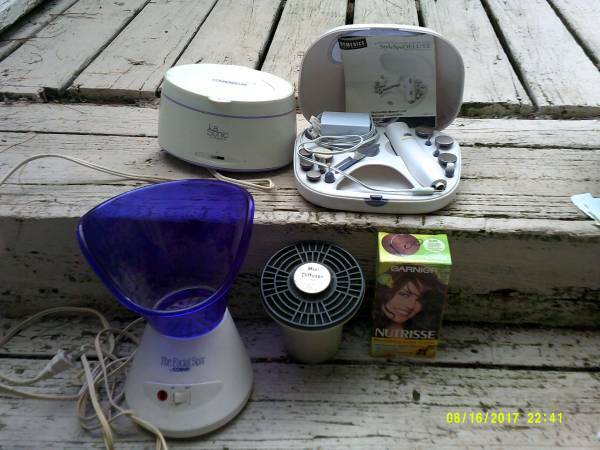 Also for sale are one mini hair dryer diffuser for $1.00 and one Nutrisse chocolate caramel hair coloring kit for $1.00. Cash and carry only.